The Wine Barrel Tasting for the Springs, sponsored the by McConnell Springs organization, is Saturday, March 25. 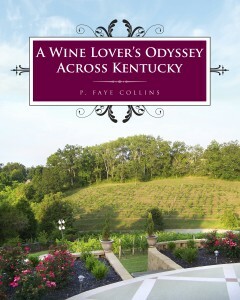 Kentucky wine lovers won’t want to miss it. Start at any of the following wineries: Springhill Winery & Plantation, Lovers Leap Vineyards & Winery, Horseshoe Bend Vineyard & Winery, Wildside Winery & Vineyard, Chrisman Mill Vineyards, Talon Winery & Vineyards, Jean Farris Winery & Bistro, Black Barn Winery, Equus Run Vineyards, Hamon Haven Winery, Prodigy Vineyards & Winery, Grimes Mill Winery, Chuckleberry Farm and Winery, McIntyre’s Winery & Berries, First Vineyard Winery and Rising Sons Winery. Enjoy a day of wine tasting and visiting wineries of the Bluegrass, in Lexington, Frankfort, Versailles, Lawrenceburg, Bloomfield, Bardstown, Willisburg, Midway, Nicholasville and Winchester. Choose your starting place and plan your visits. Times are 11 AM to 5 PM. Visit McConnell Springs website for directions. Maybe we’ll see you at one of the wineries. Even though it doesn’t feel much like it today, spring is on the way. You can tell because March Madness starts today and wine events are on the calendar in Kentucky. While you’re enjoying those basketball games, enjoy a glass of Kentucky wine and toast your favorite Kentucky team. Our state’s basketball fans can choose between University of Kentucky, University of Louisville, and for the first time Northern Kentucky University. Wine loving basketball fans can also look ahead to a March wine event. On March 25th, sixteen of Central Kentucky’s wineries will open their doors for the 10th Annual Wine Barrel Tasting for the Springs, a fundraiser for McConnell Springs, the twenty-six acre natural historic park at the springs where the city of Lexington, Kentucky was named. The event is a self planned visit from 11 to 5 PM. Visitors can start at any of the participating wineries, pay the fee of $20 per person, receive a map, and choose their route to their chosen stops. Springhill Winery & Plantation, Lovers Leap Vineyards & Winery, Horseshoe Bend Vineyard & Winery, Wildside Winery & Vineyard, Chrisman Mill Vineyards, Talon Winery & Vineyards, Jean Farris Winery & Bistro, Black Barn Winery, Equus Run Vineyards, Hamon Haven Winery, Prodigy Vineyards & Winery, Grimes Mill Winery, Chuckleberry Farm and Winery, McIntyre’s Winery & Berries, First Vineyard Winery and Rising Sons Winery are ready to open their doors to visitors. Many will have special options like food or maybe even a barrel tasting with the winemaker. A barrel tasting is a one ounce sample of wine that is still in the barrel awaiting bottling. Wine lovers get the chance to taste an early stage of their favorite wines. For more information, go to their website (www.mcconnellsprings.org). This is a special day, a chance to take part in a worthy cause for McConnell Springs and an opportunity to visit several Kentucky wineries as they are welcoming the beginning of spring. Hope you have the opportunity to attend.